Longing for past vacations to South America, dreaming of romantic dinners? The thoughts of Gauchos and grazing cattle on hillsides in Patagonia have you thinking food? Why only dream of days gone by? With our Dos Gauchos Rub, you’ll be immediately transported to those warm nights dining on sumptuous roast meats for what Argentina is most famous. There’s no need to forsake these thoughts of traveling along the Chilean border in Patagonia, enjoying feasts of the Caballeros and Gauchos. Our rub will make your choice of lamb, beef or pork taste exactly like those on the warm evenings on a country ranch, in town at an outdoor café, or enjoying dinner in an intimate backyard setting of the La Plata hotel. As a travel writer can conjure up romantic memories of past trips, our Dos Gauchos Rub does the same right at home. You may not have read, or even heard of Bruce Chatwin, but if you have visited Argentina, you miss the cuisine. Mr. Chatwin, the journalist that revolutionized travel writing by his descriptions of land and lakes, wine and foods, as well as its people, brought the wonders of Argentina to the travel-romantic reader. His incantations of after-dusk dining al fresco with friends on heaping platters of roasted lamb and provoleta salads are treasurable. For the visitor, memories of such gatherings of friends and families cannot escape you. It’s okay to admit that you long for Chimichurri (the national green salsa condiment) and Provoleta (the Argentinian version of Provolone). After all, what are thoughts of San Miguel de Tucuman, La Plata Buenos Aires, or the mountains of Patagonia without those desires? 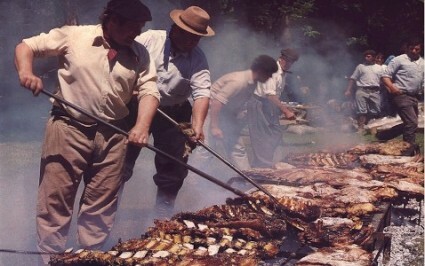 If Parillada, also called Asado (barbecue) is more suited to your dreams, why not? Grass-fed beef and a glass or two of Malbec make life in Argentina worth living, and the memory of any luscious pairings of meat, salads, and wines sublime. 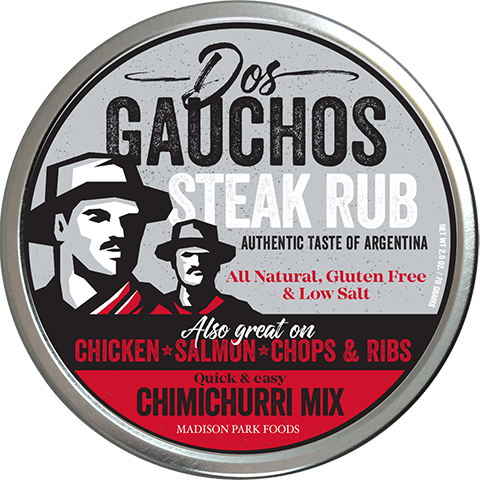 With Dos Gauchos Steak Rub you can enjoy chicken, beef, pork, lamb or even salmon made the way they did in Argentina. The authentic flavor blend of dried Red and Black Jalapeno peppers, dehydrated organic lemon peel, Parsley and Cilantro, Red Bell Pepper, Onion, Garlic is amplified with a touch of vinegar and extra virgin olive oil. A scrumptious rub enhanced with just a slight amount of salt, and it is gluten free. But huge slabs of meat are not the only way to feast Gaucho style, thin-sliced beef stuffed with vegetables, hard-cooked eggs, olives, and herbs (much of which we highlighted) known as Matambre arrollado. The meat is rolled and grilled, and eaten straight from the grill, while the heavier, thicker Asado is still cooking. Matambre arrollado translates to “Hunger Killer,” which makes sense, as diners wait on the main part of the meal, they snack on these delicious creations. Try Argentina’s national dish, Asado (parillada) the next time you break out the charcoal grill. The authentic taste of Dos Gauchos Steak Rub atop your grilling main course will help make memories in your back yard, almost equaling your vivid realities of memorable past days.